Here is a look at some of this week’s top high school sports matchups. Saturday — Lake Mead Invitational at Boulder City, 7:30 a.m.
Forty teams are expected to compete in this meet at Veterans Memorial Park. The meet starts with middle school races at 7:30 a.m. The first high school races begin at 8 a.m.
Friday — Canyon Springs at Las Vegas, 7 p.m. This game figures to be the Northeast League title game. The teams are tied for 10th in the latest coaches poll, and the rest of the Northeast League is a combined 2-15. Friday — Arbor View at Centennial, 7 p.m.
Centennial is reeling a bit after falling to 2-3 and 1-1 in the Northwest League with a 27-20 loss to Legacy. The Bulldogs need to rebound, and the rivalry game with Arbor View always is fun. Friday — Silverado at Green Valley, 7 p.m.
Two more ranked teams looking to shake off losses. Silverado fell 27-17 to Basic for its first loss of the season. Green Valley was no match for second ranked Liberty, losing 49-13. 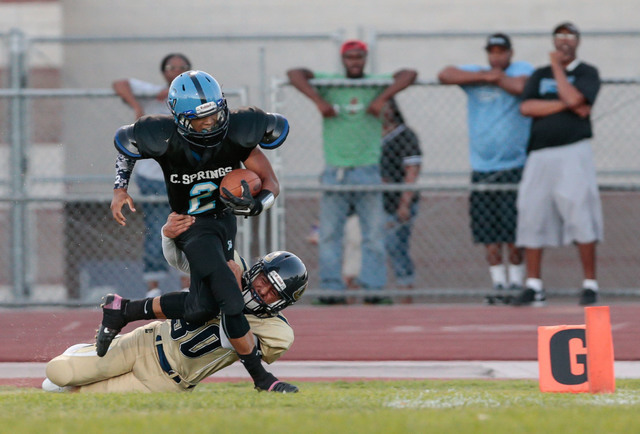 Thursday — Canyon Springs at Las Vegas, 3 p.m.
A clash of the Northeast League titans. Both teams figure to contend for the league title, and both are ranked in the top 10 in the latest Southern Nevada Coaches Poll. Thursday — Cimarron-Memorial at Centennial 3 p.m. Neither the No. 7 Spartans nor the No. 10 Bulldogs have given up on catching Palo Verde in the Northwest League. This could, however, serve as a de facto elimination game if the Panthers keep rolling the way they have been. Wednesday — Green Valley at Silverado, 3 p.m. These teams probably will be fighting for the final two playoff spots in the Southeast League after Coronado and Foothill have taken control early on. Thursday — Rancho at Eldorado, 3 p.m.
A win here for either team will keep the Northeast League title up for grabs. Las Vegas has the early lead in the league, but an Eldorado win here could spark some late-season momentum. Friday — Desert Oasis at Sierra Vista, 3 p.m.
Desert Oasis, which sits atop the Southwest League after giving Bishop Gorman its first loss last week, will look to hang onto its top spot. But beating the Mountain Lions in this rivalry match will be no easy feat. The teams tied 1-1 when they met on Sept. 14. The boys and girls Sunrise, Sunset and Class 3A Southern Region finals will be contested at the Darling Center. The action kicks off with the Sunrise Region boys final at 8 a.m.
Wednesday — Green Valley at Silverado, 6 p.m. The top two teams in the Southeast League meet with first place on the line. Both sides enter unbeaten through four league matches.